What are the “Screen Holes” in Apple II graphics? I've read the term screen holes many times in the context of Apple II graphics. From what I understand, it has something to do with the interleaving storage of graphics (or was it text) and that some programmers use this space for other things. However, I can't seem to find an explanation of what they really are, why they are used or how important they are (if at all). Can someone explain what they are or at least point me to a good reference? 1. What are screen holes? The Apple II video architecture is based around a text display of 40 columns by 24 rows. Woz had already built an ARPANET terminal for a TV, and said in his book iWoz that "Forty columns was the limit of American TVs". To map those 40 column rows into memory sequentially would for various reasons have increased the chip count - something Woz strove to minimize. He could have mapped 40 columns to 64 bytes and wasted 24 bytes per row, but every byte was precious back then. As a compromise he mapped 3 rows to each 128 byte block, leaving 8 bytes unused in each of the 8 blocks - the screen holes. 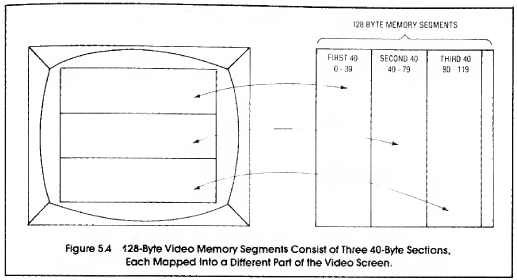 Sather's books have an excellent discussion on the how the bytes in memory map to the display for each video mode. Here are the address ranges for TEXT/LORES page 1 memory from Figure 5.5. TEXT/LORES page 2 follows the same pattern - just add $400 to the addresses. In fact HIRES pages 1 and 2 also follow exactly the same pattern, but repeated 8 times each from $2000 and $4000. In summary, screen holes are sections of video memory that are not displayed. Technically they exist in all video modes and in both Main and Auxilliary memory, but the term "screen holes" usually refers to those in Main TEXT page 1, which have special significance as discussed next. 2. What are screen holes used for? Slot 0 does not have any scratchpad RAM addresses reserved for it. The Base Address locations are used by Apple DOS 3.2 and are also shared by all peripheral cards. Both the Apple //c and the Apple IIgs firmware for built-in devices uses the screen holes. In addition the Apple //c uses several areas in Auxilliary memory including the Aux TEXT page 1 screen hole at $0478-$047F as documented in Table B-4 of The Apple IIc Technical Reference Manual. The book Inside the Apple //e by Gary B. Little provides excellent explanations for why "screenholes" exist in the Apple II memory map, and how they are used, by convention. The memory for each page of the display is a 1024-byte block, but each character on the 40x24 text display uses 1-byte, for a total of 960 bytes. This leaves an unused 64 bytes in the display memory block. These unused (for display data) "screenholes" are dispersed across the 1024-byte block as 8 separate 8-byte holes. The base addresses for the 8 holes are $478, $4F8, $578, $5F8, $678, $6F8, $778, and $7F8. By convention, each of these holes may be utilized as "scratch pad" RAM by each of the 7 peripheral cards. The convention is necessary so that other software does not stomp on these memory addresses. It is specifically set aside as peripheral "scratch pad" where each card gets 8 bytes, plus there is 8 bytes taken for DOS use. The addresses available to each card are based on which slot it occupies, and the 8 addresses assigned to the card are computed using, 's' as the slot number, thusly: $478 + s, $4F8 + s, $578 + s, $5F8 + s, $678 + s, $6F8 + s, $778 + s, and $7F8 + s.
What was the change to the Apple //e motherboard that allowed for Double HiRes graphics?